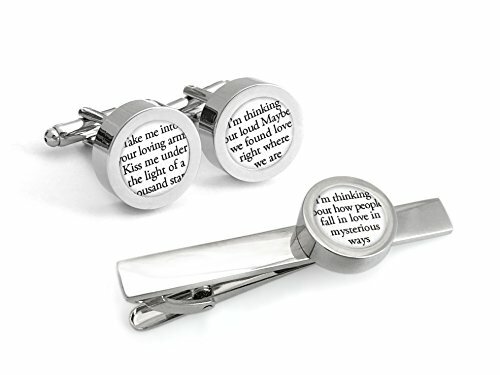 Personalize this gift set with your wedding vows or first dance song lyrics! The words will be professionally printed on paper inside of cufflinks and a tie bar. A romantic first anniversary gift for your husband. The 1st anniversary is traditionally the paper anniversary, so this "paper" gift of written vows has a meaningful symbolism. Simply click "CUSTOMIZE NOW" and type up to 19 words for each piece. I will design the pieces and carefully be sure that the most important words are perfectly formatted & featured. Message me for ANY questions! I will reply within a few hours. Processing time is 1-2 business days. If you have an urgent request, please message me. "This was the most unique, special gift for my husband for our first "paper gift" anniversary! Anna picked the perfect part of my vows and I received it so quickly! He was definitely surprised and quite blown away :) !" ★★★★★ KATY W.
A first anniversary gift that he can keep forever! Manufacturer: Paper Anniversary by Anna V.
Brand: Paper Anniversary by Anna V.
Publisher: Paper Anniversary by Anna V.
Studio: Paper Anniversary by Anna V.
If you have any questions about this product by Paper Anniversary by Anna V., contact us by completing and submitting the form below. If you are looking for a specif part number, please include it with your message.